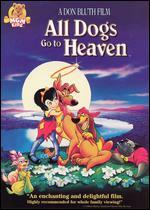 All Dogs Go To Heaven: The Series was based on the 2nd Don Bluth movie All Dogs Go To Heaven 2, as Charlie B. Barkin, and his longtime friend/sidekick, Itchy Itchiford, become Gaurdian Angels, helping people and dogs alike on Earth, while being under the watchful eye of the Archangel Canine, Anabelle. 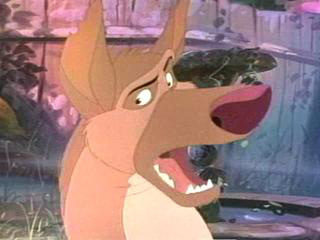 Burt Reynolds as Charlie B. Barkin, a roguish German Shepherd. The character was designed specifically with Reynolds in mind for the role, and the animators mimicked some of his mannerisms in the character. Dom DeLuise as Itchy Itchiford, a twitchy Dachshund who has long been friends with Charlie. DeLuise reprised his role in the sequels and spin-off television series. Judith Barsi as Anne-Marie the orphan girl with the ability to talk to and understand any animal. This was Judith Barsi's second role in a Sullivan Bluth film, having previously played the character of Ducky in The Land Before Time. It was also her last role; her father Jozsef Barsi murdered both her and her mother Maria Barsi on July 25, 1988, before the film was completed. Vic Tayback as Carface Carruthers, a shifty Pit Bull Terrier gangster who runs a casino with Charlie, who he later kills when he become displeased with his plans. Charles Nelson Reilly as Killer, a misnamed mongrel who is Carface's sidekick until the boat is destroyed. Reilly reprised his role for the spin off television series. Loni Anderson as Flo, a female Rough Collie and friend of Charlie. 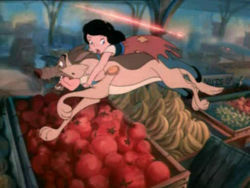 Charlie and Anne-Marie bring her and the puppies a pizza, and they sing a song about sharing, "What's Mine is Yours". 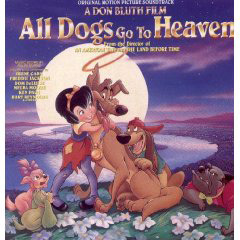 Melba Moore as the Whippet Angel, a whippet who welcomes deceased dogs to Heaven. Later given the name "Annabelle" in All Dogs Go to Heaven 2. Ken Page as King Gator, a huge and flamboyant alligator living below the streets of New Orleans. King Gator's musical number, Let's Make Music Together, is a parody of the elaborate water ballets seen in Esther Williams films. 11 Will Success Spoil Itchy Itchiford? But the only way this pup knows is up!